Great photos of the sea animals -- very colorful! Day Nine was another "down day". Hubby and I had some obligations, then we just enjoyed the comfort of having our daughter and her daughter visiting us. Day Ten was a busy day. It started by taking one of our cars to the mechanic, where he will have it for several days while he attempts to find out why it lost freon. No A/C in the car during the hottest weeks of the year is NOT fun! Our next stop was at Sun Diego Car Rentals, to pick up a rental mini-van. We did some calculations and figured that renting a mini-van would be less expensive than taking two cars on our 3-day jaunt and having two cars add 800 miles and paying gas for them. We rented a 7 passenger mini-van, a Ford Freestar. Sun Diego Car Rentals is a local place, so you don't have the backing of a nationwide rental. It also does not allow its vehicles to leave the tri-state area (CA, NV, AZ). They DO have cars available for travel into Mexico (Baja California). We crammed four adults and two babies in car seats into the mini-van. We didn't get to take everything we wanted to, because mini-vans aren't known for their expansive cargo space. But for the three days, we figured everybody would have to give in a little. It was a walk down memory lane for us. Our daughters, getting ready to go, got into an argument with their dad. Then later, listening to two babies in their car seats, brought back memories of our girls (who were about that far apart in age, a year) when they were that age. It was a trial. The 5 month old had never been on a long car trip like that. He cried about being in his car seat for long periods of time. We figure, he has family in Arizona, he's going to get used to road trips! The 16 month old was good as gold. She liked getting down to run, but with the oppressive heat of the deserts in Southern California and Arizona, on the way to Phoenix, there wasn't much of that. So when she got to my parents' home, she explored and ran. She's still happy. There are two purposes to this trip: introducing the babies to long-distance car trips, and introducing them to their great-grandparents. Day Eleven of Stay-Cation, Phase I, was a relaxing day in the Phoenix area. With daytime temperatures hovering around 115 F, nobody wanted to go anywhere. The great-grandparents had a little time to enjoy their great-grandchildren, play with them, read to the older one (she loves books), and the adults all had time to visit. We also ate and ate. Normal! Day Twelve was the return trip to Southern California. We left at 8:00 in the morning, picking up a load of fuel at CostCo ($3.29/gallon) for the van because one daughter had a CostCo card. We stopped for lunch at Golden Corral in Yuma on the way home, and picked up another small load of fuel ($3.42 at Arco there). * Add about 20% more time to the time it usually takes for the trip, because of extra stops for diaper changing, things lost in the vehicle, and nursing. Our 6-3/4 hour trip became 8 hours on the way over, 7-1/2 on the way back (because we started earlier in the day). * Even babies have to be entertained. The female adults in the car sang every little-kid song we know, taking turns choosing the songs. Sometimes one would start the song and somebody else remembered the last verses and finished it. * Be prepared to "tune out" crying when the diaper needs to be changed and there isn't another rest area for awhile. * Plan for a way to sleep the babies in the event that a place does not have a crib. My parents haven't had cribs for years. We brought two Pack-n-Plays (a portable crib/play pen). They worked perfectly. * Most restaurants have high-chairs and an extra chair to put a baby seat if your child does not fit into the high chair. Be sure to ask if they don't help you. Since this was not a sight-seeing trip, the photos I took are not scenic. They were mostly family photos. Back to seeing San Diego! Day 13 of Phase I was another "down day". The babies needed to rest and the adults just wanted to visit without getting in the car to go someplace. Day 14 was "Mission San Diego de Alcala" Day. This mission is the most southern of the 21 missions along the El Camino Real. The Mission is located near the junction of I-15 and I-8, just off Friars Road. There is no charge to visit the mission, though they like to suggest a donation of $3 per adult ($2 for seniors 55+) and $1 per child. We entered the Mission area by climbing a lot of steps -- not easy when you have a stroller, and there are no ramps. We carried the baby and the stroller. Once you are up the steps, you go through an alcove and then into the Gift Shop. You must go through the Gift Shop to view the Mission. This is a working mission -- it is still an active Catholic church. Next door is the Nazarene School, run by this church. If you go to the left after you are into the Mission area, the first room you see is the Padres' quarters. The next place on the self-guided tour is the chapel. It was absolutely beautiful. As I said, this is an active facility, so there was a man in there dusting all of the pews. In the courtyard there is a lovely fountain. It was a beautiful day in Southern California, and the fountain was a nice place to take a rest. From there we went to "El museo", or the Museum. The museum was small and had many artifacts, some of which were found during the archeological dig. One display caught my eye. There was an archeological dig at one time. No one was working on it during our tour here, but they were excavating the "convento" (convent/monastery). This doesn't take long to see -- an hour or two at the most. I can't believe I missed seeing this little gem in the 30+ years I've lived here in San Diego! Last edited by DonnaR57; 07-05-2013 at 07:56 PM. Day 15 was the final day of Phase I, as the visitors had to go back home. So sad to say goodbye, knowing we won't see them until the next road trip eastbound, for us. We decided to do an afternoon visit at the Museum of Making Music. Our entire family loves music and has been involved in making it since childhood, either by singing or playing an instrument. Even our 16-month-old grandchild shows signs of being a singer someday, as she is always singing in her own language! This museum is located in Carlsbad near the Palomar Airport (an aircraft for small craft and small jets). You begin your tour just past the gift shop in Gallery 1. You start in the late 1800s and move through the 20th century, popular music. Since the museum is the lower floor of the NAMM (National Association of Music Merchants) and is one of their main sponsors, this is not surprising. As you progress through the 5 main galleries, you learn about the types of music in a 20 year period, the instruments that were developed in this time frame, see what advances were made in technology, and you can press many buttons to hear the music of the period too. The last gallery is a exhibit that changes every 6 months. This exhibit today was about the Harp. Should you think that the museum is all about instruments, they also covered sheet music, recordings, and the way to play recordings. Here was an old phonograph, and they had records around too. There were also cassettes and 8-tracks, and a synthesizer that used 5-1/4" floppies. In the exhibit about the Jazz Age, there were many instruments behind a glass. This one, above, was of an early drum kit. My husband says he really prefers his Pearls. When someone says "bass", I usually think of a string bass or a bass guitar. However, this one shook me a little bit. It was a cross between a modern string bass and a washtub bass (from Appalachian folk music). We saw many types of instruments and even got to play on some. Every gallery had at least one instrument that you could play, usually with headphones on. For the instrument above, though, we were not allowed to play it. Two of us didn't need to. It was the same instrument that we used at college, in our piano lab classroom! We ended with the harp exhibit. We didn't read every single thing, and we were there almost 2 hours. If the grandbabies hadn't been with us, I would have spent several hours more, just reading all the display boards. I highly recommend this for people interested in music who live in or visit the San Diego area! Thank you Donna. I haven't been to the Museum of Making Music so it's nice to have something new on the LA to SD route. The second set of family arrived a few days ago, from Missouri, so it was time to embark on the next phase of our at-home vacation. This family hasn't been to California in 4 years, but there was only time enough to do the beach and Sea World when they were here last, because they were here for a wedding (our daughter's). We asked them what they'd like to do, and we started making reservations and arrangements. Day One was their arrival in late afternoon. Southwest Airlines has a great habit of being EARLY if they possibly can. That's always a plus. Their luggage also came with them, which was great too. Day Two, the travelers really needed to sleep and relax at first, to try to adjust to gaining two hours. We set off at 12:45 pm headed for Anaheim, where we had hotel reservations for two rooms. Our intention was to stop in San Clemente at about 1:45 and have lunch. Well, it was 2:30 before we got there because of a traffic snarl that had slow-n-go traffic for 20 miles. (Betcha that MapQuest can't predict those, and our GPS wasn't much help either.) We had a lovely late lunch at Carrow's on the north side of San Clemente, then got back into the traffic. Thank heavens, about 3 miles up the road, it was normal again. We pulled into the hotel just before 4 pm, checked in, unloaded the car, and caught the hotel's shuttle over to Disneyland. The hotel was the Candy Cane Inn on Harbor Blvd. in Anaheim. We are almost literally in the backyard of Disney's California Adventure. The hotel has been here since just after Disneyland (DL) opened in 1955, but it's been upgraded so much that you'd think it was a fairly new place. It has a lovely pool, hot tub, a nice breakfast spread, and the rooms are clean. Beds are comfortable. We took two "standard" rooms since all we'd planned to do at the hotel was clean up, swim once or twice, and sleep. They are the smallest rooms. Our original plan was to share our room with the daughter and her husband, but we were glad when their plans changed and we didn't have to share! The hotel only offered a discount to AAA or AARP members and active duty military, so we were able to grab two rooms at the AAA price. The shuttle ran every 1/2 hour so we caught the 4:30 and headed for Disneyland. We had three day park-hoppers that we picked up at the base (for the price of a one day park hopper at the gate! ), so we had to switch the voucher to a ticket, which they did right at the gate. Let's see....Space Mountain (roller-coaster through space), Buzz LightYear's Astro Blasters, Matterhorn Bobsleds, lots of looking, It's a Small World (which annoys my husband but I *love* it), Pirates of the Caribbean, fireworks, eating cotton candy, and so much more. That first evening, the weather was overcast and cool, so much that my skinny-minnie niece needed to go buy (!) a sweatshirt to keep warm. She hadn't even brought one to California, much less up to Anaheim. The day ended by catching the hotel shuttle back. In the past years, we've always stayed on the other side of the parks, at Best Western Stovall's, and then made the trek back to the hotel on foot each day. Stovall's not only does not have a shuttle, they charge the guests extra for parking. So...walk and pay for parking, or get a shuttle? We opted for the place with the shuttle this year. We weren't familiar with the shuttle place, so that was new to us. 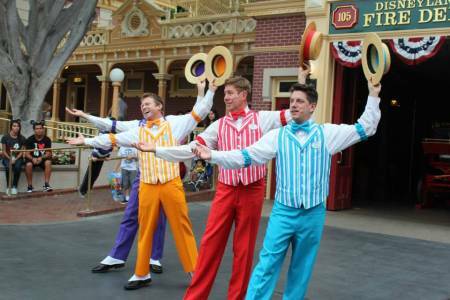 Very similar to WDW FL! Photos to come -- still stuck in my camera! The following day was the first FULL day in Disneyland. Though we did have park-hopper passes, we chose not to utilize those because of the sheer amount of *walking* that would entail. 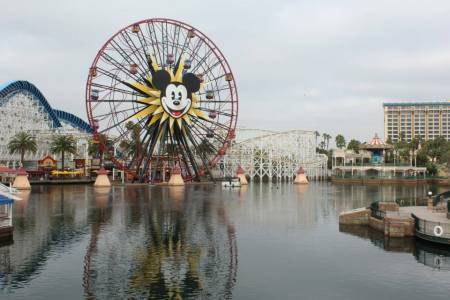 Yes, Disneyland and California Adventure are right across a quad from each other, not all that far. However, it still means walking since there currently is no transportation between the parks like a monorail system. We were up early that morning and on the 7:30 am shuttle. Our daughter and her husband were to join us for the two days, so we had to wait in the Quad for them -- we had their tickets! They had to bring the baby, as the other grandma canceled out when she caught the flu. That was an unexpected drain on our packed days, as there are quite a few attractions which are not open to babies or small children. But we managed. We started the day with Star Tours, moving on to Space Mountain and Buzz Light Year's Astro Blasters, taking advantage this time of Disney's "Baby Swap" program. 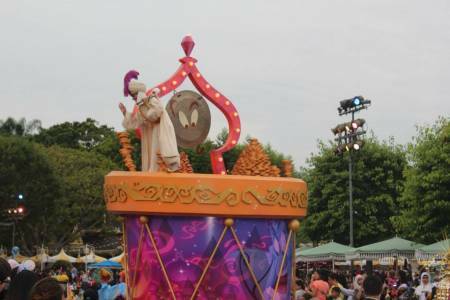 This allows people to ride the attraction and leave the baby with another in their party, then switch baby care to allow the second half of the party to ride. Most of the time, five of us rode, and then the parents rode while we watched the baby. Sometimes one of the firve got to ride again, which was usually my niece! We tried to go see Captain E.O., the Michael Jackson tribute. Unfortunately, we were so comfortable and then the sound on the attraction (which was a 3D music video) went out. So we had to get up and move on. I think in 40+ years of visiting Disneyland, this was the first time I'd ever had to leave an attraction in the middle because of a technical difficulty! Other things that day included the Haunted Mansion (baby could ride), Pirates of the Caribbean (ditto), Indiana Jones, The Enchanted Tiki Room (baby could go), a train ride (ditto). 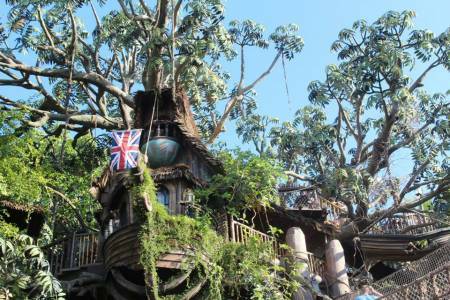 Two of the men and my niece went up in Tarzan's Treehouse, but my SIL and I both declined due to our knees and all those steps! 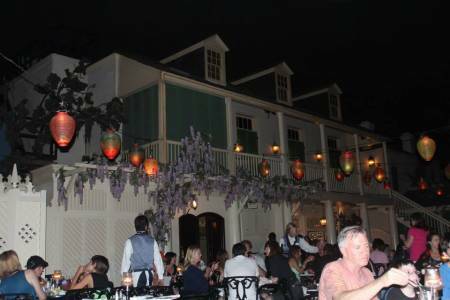 We had a lovely dinner at the Blue Bayou on the waters of the Pirates of the Caribbean ride. The food was expensive but VERY, VERY good. We had waterfront seats, which was a long story in itself, but it worked out. Tried to watch Fantasmic, but we didn't find a good standing place and couldn't see 3/4ths of it. So we moved on right before it ended. Niece wanted to go on Splash Mountain, so she took her dad and her uncle. Unfortunately, when the log landed at the bottom of the drop, her dad bounced up and then landed HARD on his seat, injuring his tailbone. He is a nurse, and he thinks it's probably severely bruised. By the time we caught the shuttle and got back to the hotel, it was almost 11 pm. Yawn, as we were going to start the next day EARLY. The original plan had been to share our hotel room with our daughter and husband. But when they found out they'd have to either cancel out or bring our grandson, they got onto Priceline and landed a good rate for a hotel. That hotel was a 10 minute walk to DLR, a Travelodge, and allowed them to park all day on arrival day (checking in later) and all day on the day of departure (checking out before they left to enjoy the park). They had good things to say about it, including that they had enough room for the baby's Pack-n-Play. Our own evening was much quieter, probably! Fast Pass time was 10:00 time frame, so we went off to explore the rest of the park. We had not been there since the big remodeling job, so quite a few things were new to us. When the adventurous people discovered that California Screamin' (a major roller coaster) had just a 5 minute wait, they rode it...TWICE. We went back a little later to find a 15 minute wait, but they all rode it except me then -- I was watching little guy. We rode Mickey's Fun Wheel (like a Ferris wheel), the Carousel (little guy had to go on that one with Mommy and Daddy while Grammy took pictures), and then we walked over to Cars Land. CarsLand is set up like old US-66 when it went through the fictional town of Radiator Springs. When I post photos later, I will be sure to post a lot of this section of the theme park. It was a road-trippers dream! 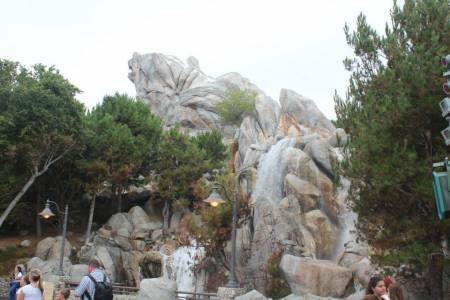 The biggest "E-ticket" ride in that section is called Radiator Springs Racers. You are first road tripping through the town, but then you get side by side with the folks in another car and you actually have a race. Our car won. It was fun! We did other rides in California Adventure and saw both the Muppets 3D show AND the Broadway style live musical version of ALADDIN. LOVE that show, and it was incredibly well done. Others may think "Sacrilege!" but after our poor viewing experience with Fantasmic, and not wanting to queue up for 2 hours by sitting on pavement to wait for World of Color, we got on the shuttle and went back to the hotel. We were all exhausted. We did walk across the street from the hotel where there was a strip mall with 3 or 4 places to eat. We chose pizza and enjoyed the late (8 pm) dinner. Last edited by DonnaR57; 07-24-2013 at 05:10 PM. Photo time, as promised! I took over 550 photos in three days, deleted about a third of them because I was trying to shoot available light and metered incorrectly on the fly. Here are some of the better photos. This is the entrance to the parks that is used by the local hotel shuttles, Anaheim Resort transport, Orange County transport, and by foot traffic from that side of the park. Yes, it was overcast that day, and the second morning too though the sun did appear around 9 on the 2nd day. The view down Main Street USA as we entered the park on the first day. 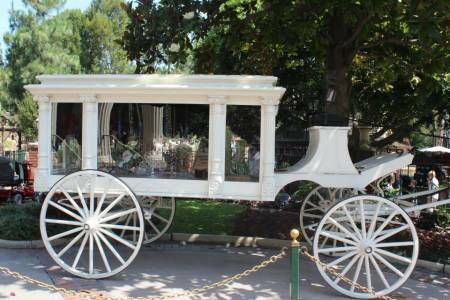 On the second day, we went through the Haunted Mansion, since there are no height limits and we could all go together. We did have to ride on 3 separate "doom buggies". Our hotel was the lovely Candy Cane Inn -- a Good Neighbor hotel and not extremely expensive. 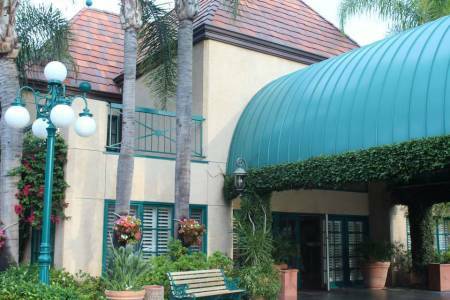 It's independently owned and on a par with Comfort Inn, as far as quality of the lodging goes. 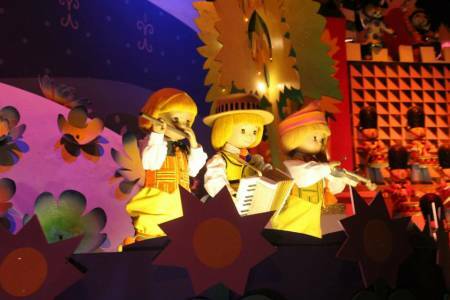 Sing along with me: "It's a small world after all, it's a small world after all, it's a small world after all, it's a small, small world...."
Parades go through Disneyland and California Adventure twice a day. This one was at Disneyland and was a character parade. Here's Aladdin! 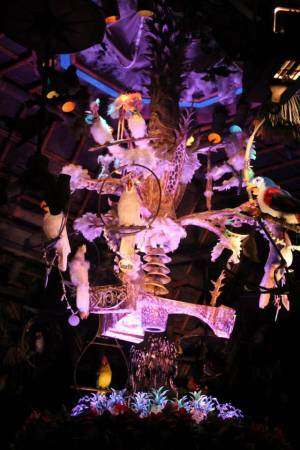 OK, now that you've got the Small World song stuck in your head, how about trying this one: "in the tiki, tiki, tiki, tiki, tiki room....all the birds sing words and the flowers croon..."
Last edited by DonnaR57; 07-24-2013 at 09:14 PM.